Summer is the perfect time to get your thrills at an amusement park, but a day of rides can put a big dent in your budget. Here's how to tap into frugal fun at Six Flags amusement parks. Six Flags owns over 15 locations around the U.S., so chances are there's an exciting amusement park near you. Admission can be costly, though, so buy your tickets online before you go. One great place to look is eBay where you can save as much as 50 percent on the admission price. Remember, it takes time to ship, so plan ahead. Many Six Flags locations also give discounts later in the afternoon when families have had their fill and gone home for the day. This is a great time to get a solid day at the park for less. 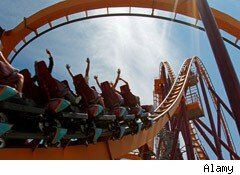 To help you pack more rides into your time there, try checking IsItPacked.com, a website that offers live crowd tracking. This way you can maximize your time, too. If you're looking for big savings, consider investing in season passes. Passes cost about $15 or $20 more than single day ticket, so if you go just twice in the same season, you're already getting a better deal. Each time you go, you'll be reducing your per-visit costs and ultimately be getting a big bargain for multiple days of fun. Another plus: you won't feel like you have to cram everything into one visit. So, if you consider yourself to be a thrifty thrillseeker, use these tips to save this summer. You'll keep you and your family entertained -- and make great memories -- without breaking the bank.